Santa Claus is without a doubt the most recognizable figure associated with Christmas. Santa stands for goodness, kindness and a generous, giving spirit. Today, Santa is an essential part of Christmas celebration, but the modern role and image of Santa Claus saw the light in early America of the 19th century. Dutch, British and American influences came together to give us the Santa Claus that we all know today: the jolly old man with his red & white costume, distributing gifts with his team of elves and reindeers. The name Santa Claus was Anglicized from “Sinterklaas,” the Dutch word for Saint Nicholas, famous gift-giver and protector of children. It is believed the legend of Santa was brought to the New World by Christopher Columbus, who, upon arriving in Haiti, named a port after the patron saint. In 1621, when the Dutch landed on the New York island of Manhattan, they erected a statue of Saint Nicholas as a tribute to him for their successful journey. In 1809, Washington Irving (a member of the NYC Historical Society which promoted St. Nicholas as its patron saint), created a tale of a chubby, pipe-smoking Saint Nicholas who rode a magic horse through the air visiting all houses in New York. The elfish figure was small enough to slide down chimneys with gifts for the good children and switches for the bad ones. The works of writer Clement Clark Moore and the cartoons of Thomas Nast had also a big influence on the present form of Santa. The stories of St. Nicholas, Santa Clause and Kriss Kringle mingled to the new character of Santa Claus, the sum total of several stories, customs and beliefs. Around the world, most people know Santa Claus and have local-language names for Santa – even if they come from countries where Christmas is not celebrated. Santa or similar gift givers go by these translations in the following countries: “Le Père Noël” (France and Québec), “Weihnachtsmann” or “Nikolaus” (Germany), Papá Noel” (Spain and Mexico), “Joulupukki” (Finland), “Julenissen” (Norway), “Juletomten” (Sweden), “Babadimri” (Albania), “Gaghant Baba” (Armenia), “” (Denmark), “Babbo Natale” (Italy), “Papai Noel” (Brazil), “Санта-Клаус” (Russia), “Ježíšek” (Czech Republic), “Święty Mikołaj” (Poland), “Pai Natal” (Portugal), “Moş Crăciun” (Romania), “Daidí na Nollag” (Ireland and Scottish Highlands), “Dyado Koleda” (Bulgaria), “Noel Baba” (Turkey), “Deda Mraz” (Serbia and Bosnia & Herzegovina). But our favorite is without a doubt the Afghanese name for Santa: “Baba Chaghaloo”. And the Chinese name also sounds very cool: Sheng Dan Lauw Yeh Yeh (phonetics of 圣诞老爷, which means “Christmas Old Man”). In England Father Christmas is a stern version of Santa Claus who brings gifts on Christmas Eve. In France “Pere Noel” brings gifts to children on Christmas Eve. Children leave their shoes by the fireplace. In Germany families go to church on Christmas Eve. While they are at church the “Christkind” or Christ Child brings presents to their homes. In Switzerland the “Christkindl” or Christ Child brings the gifts. In some towns, Christkindl is an angel who comes down from heaven to give gifts. The Dutch “Sinterklaas” arrives by boat from Spain. Children leave their shoe on the eve of 6th December filled with hay and carrots for the donkey which carries St. Nicholas’ pack of toys. Children get toys and candy. In Sweden, a gnome called “Juletomten” brings gifts in a sleigh driven by goats. In Spanish-speaking countries such as Spain, Mexico, South America, children wait until January 6th for their presents. The Three Kings or Wise Men bring the gifts. Children put shoes by the front door to get their gifts. There is usually a big procession through the streets with floats for each of the Wise men. In Italy “La Befana” is a good witch who dresses all in black. Children leave their shoes by the fireplace on the eve of January 6th. Befana comes down the chimney on her broomstick to leave gifts. In Australia, Santa rides waterskis, has a white beard and red bathing suit and sometimes even has “bikini helpers”. When the name Santa Claus is mentioned anywhere in America today, the image that invariably comes to mind is the one created by Haddon Sundblom for the Coca-Cola Company. 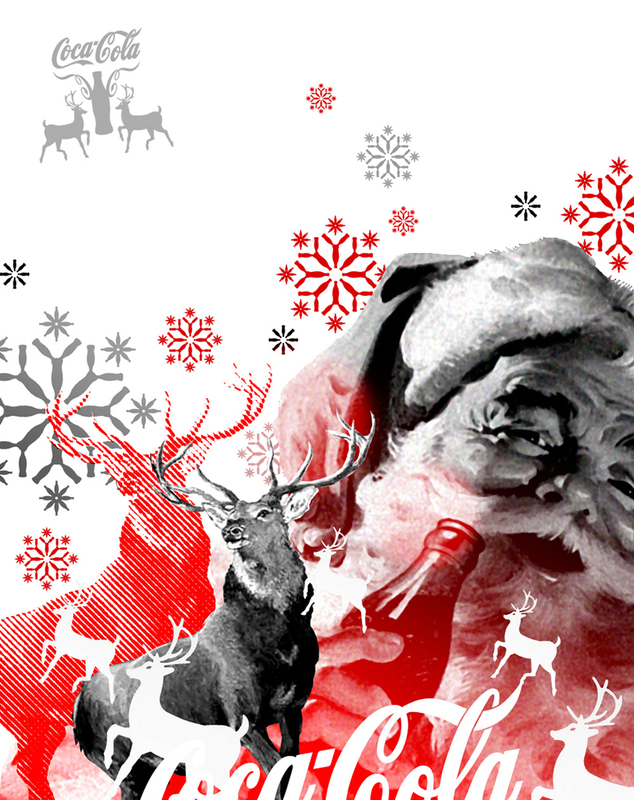 From 1931 to 1964, Sundblom painted new Santa illustrations to use in the Coca-Cola Christmas advertising. 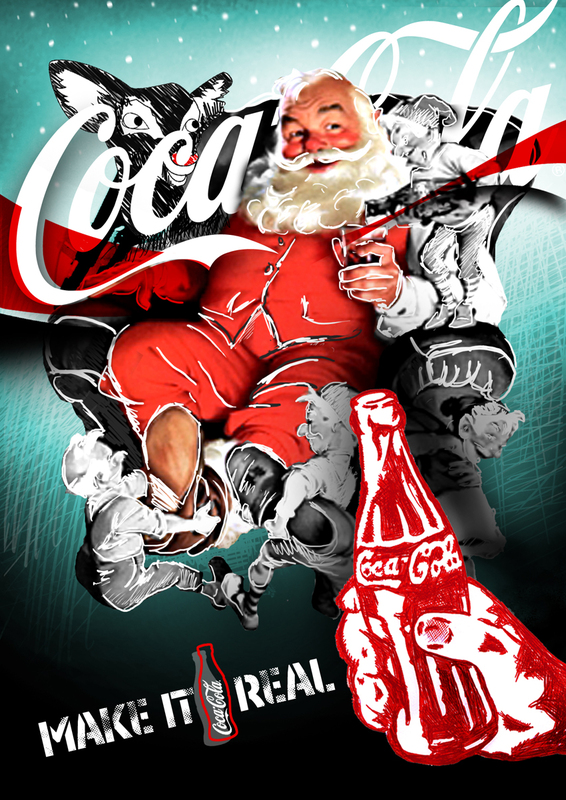 Today, Coca-Cola continues to use Sundblom’s Santa Claus artworks. Many of his Santa paintings have toured museums and art institutes around the world. The smiling figure still appears regularly on posters and in magazines, newspapers, calendars, Christmas tree ornaments, serving trays and glassware. 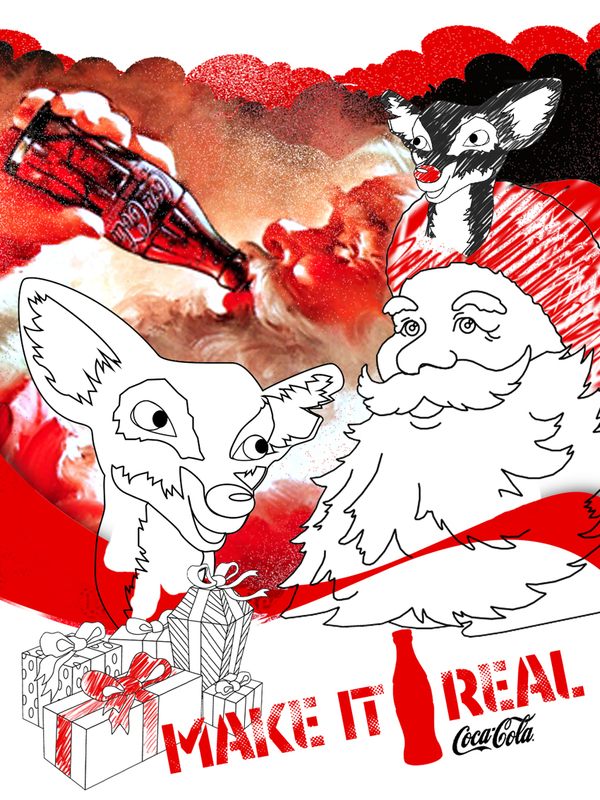 Coca-Cola Christmas artworks by RockAndRoll Agency. Art Direction: Wouter De Coster. Brand Team Coca-Cola: Guy Rombouts & Bram Clincke. All Rights Reserved © The Coca-Cola Company. Halloween has always been a holiday filled with superstition, magic and mystery. When European immigrants came to live & work in the USA in the 2nd half of the 19th century, they brought a variation of “Hallow’s eve” traditions with them. The beliefs & customs of different nationalities mixed with local celebrations of American Indians, and soon the American version of Halloween was born. Neighbors would celebrate the harvest, lit bonfires, share spooky stories about ghost and witchcrafts, have some drinks, dance & sing. At the turn of the century, “Hallow’s eve” aka Halloween lost most of its superstitious overtone and the fearsome and malevolent ghost -stories were replaced by parades and town-wide parties. From 1920, the centuries-old Irish practice of trick-or-treating was also revived. Americans began to dress up in festive costumes and go from house to house, asking for sweets or money. A new American tradition was born, and it has continued to grow. Over the years, Halloween has become a significant part of American culture. Today, Halloween is the second-largest commercial holiday in the United States (next to Christmas) with Americans spending an estimated 8.2 billion annually on candy, gifts, decoration and costumes. The Halloween tradition of dressing in costume has ancient Celtic roots. Many centuries ago, winter was a very uncertain and frightening time. The short and cold days of winter were full of constant worry. Many people were afraid that their food supplies would not be sufficient, were afraid of the dark and frightened by the evil spirits out there. To avoid that the ghosts would recognize them, the Celts started to wear masks when they left their houses so that the mean spirits would mistake them for fellow ghosts. On Halloween, they would also place bowls of food on their doorstep, to appease the ghosts and prevent them from trying to enter their homes. Today, most trick-or-treaters and Halloween party people have forgotten about the original traditions and beliefs. Few people really know for example when or why the pumpkin carving practice began. 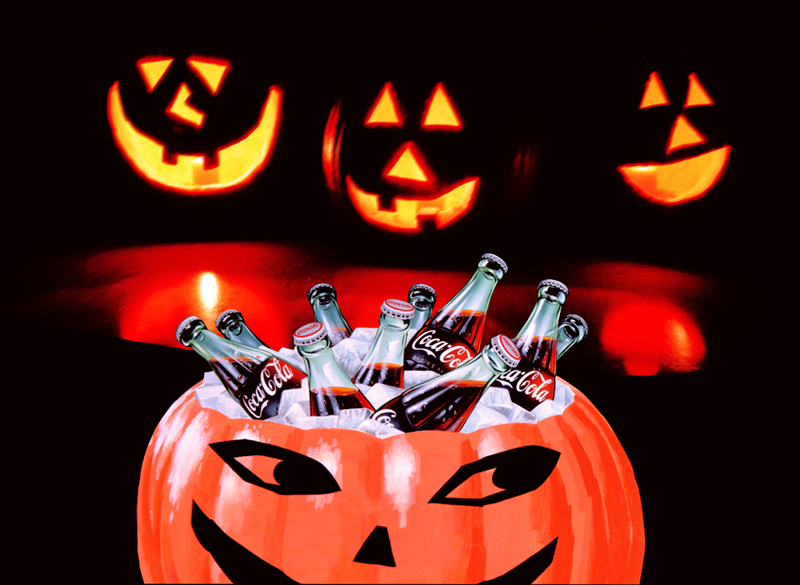 With the “Happy Halloween” campaign, Coca-Cola focuses on the roots of “Hallow’s eve” and brings the story of Jack O’Lantern aka “Stingy Jack” back into the spotlight. Jack O’Lantern illustration by Daniël Maas. Stingy Jack grew up in a small Irish village were he quickly earned the reputation of being clever as well as lazy. Instead of working, he preferred to relax under his favorite tree, a solitary oak. In order to earn an “easy shilling” to spend in the local pubs, Jack gambled and played tricks on everyone: friends, family and even his mother. One Halloween, the time came for Jack to die and the devil arrived to take his soul. According to the Irish myth, Jack invited the devil to have a last drink together. True to his name, Stingy Jack didn’t want to pay for the drinks, so he convinced the devil to transform himself in a coin that Jack could use to pay for their drinks. The devil agreed, but Jack decided to keep this “devil coin” in his pocket next to a silver cross, preventing the devil to change back into his original shape. Jack would not let the devil free until he was promised another year of life. The next Halloween, the devil appeared again to claim Jack’s soul, and again Jack bargained, this time challenging the devil to a game of dice, a game that he excelled at. The devil threw two ones and was about to win, but Jack used a pair of dice he had whittled himself. Jack threw two threes, forming the T-shape of a cross and once again he had the devil in his power and he bargained for more time. The year rolled around to another Halloween. This time, Jack tricked the devil into climbing in an apple tree. Once the devil was up there, Jack hurriedly placed crosses around the trunk, making it impossible for the devil to get down. After some time, the devil came with the deal that he would never take Jack’s soul, so Jack removed the crosses and let the devil go. Years later, death took Jack by surprise. When jack arrived in front of the gates of heaven, St. Peter would not let such an evil character enter. The devil, still upset by all the tricks that Jack had played on him, kept indeed his word and didn’t allow Jack into hell. Jack was sent back into the cold & dark night with only a burning coal to light his way. Jack placed the coal in a hollowed out turnip, a vegetable he always carried around whenever he could steal one. From that day on, Jack and his carved-out turnip lived as a pair of inseparatable twins, the vegetable lighting Jack’s way as he roamed the earth without a resting place. The Irish started to refer to this scary personage as “Jack of the Lantern,” and then, simply “Jack O’Lantern”. On Halloween, they carved scary faces into turnips, potatoes, rutabagas, gourds or large beets and placed them in front of their houses to scare away Stingy Jack and ward off other evil spirits. European immigrants brought the Stingy Jack tradition with them when they moved to the US. They quickly discovered that pumpkins, a fruit native to America, were bigger and easier to carve out. So they started to use pumpkins, making perfect Jack O’Lanterns. Halloween is coming. Carve some pumpkins, take the torches, cauldrons, masks & skeletons from the closet & dress up as Batman, a candy corn witch, devil grrrl, clone trooper or a black widow. 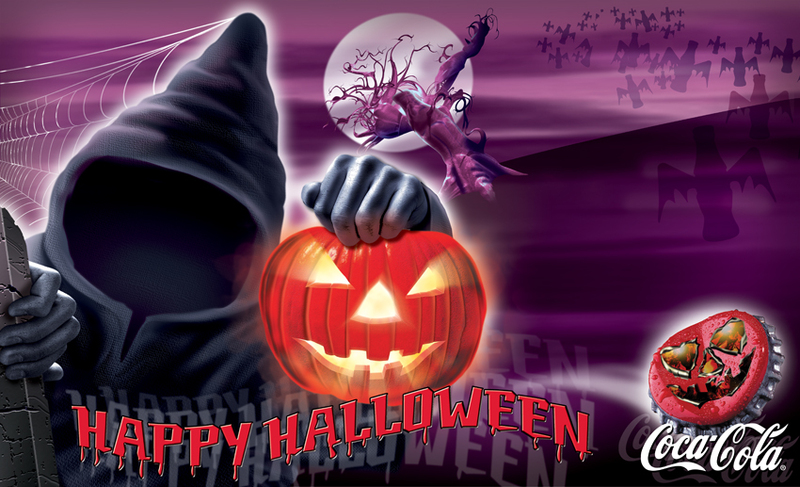 And what is Halloween without a scary Halloween wallpaper on your desktop? 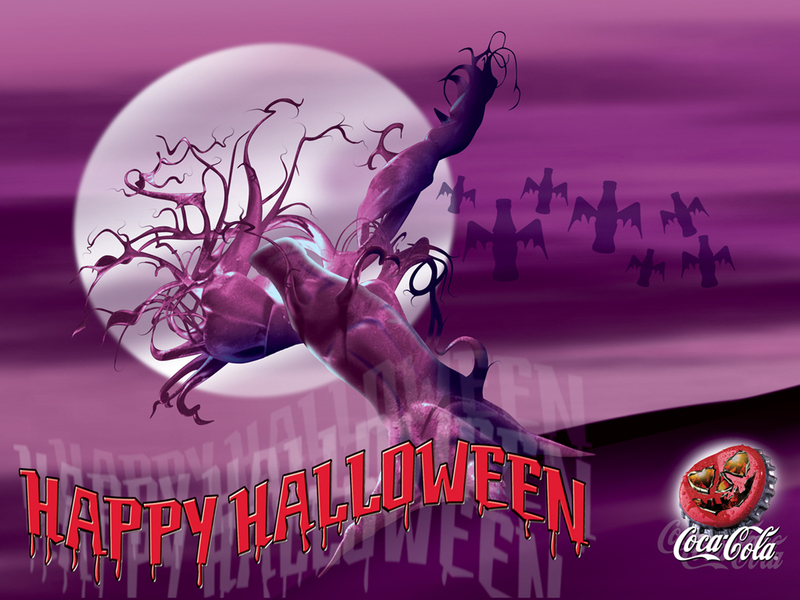 You can download these free Coca-Cola Art “Happy Halloween” wallpapers by clicking on the link under the artwork. 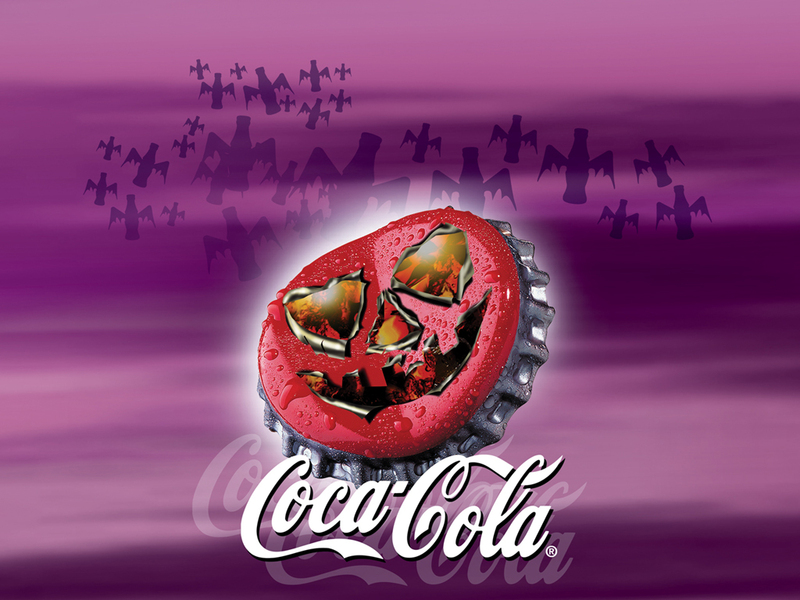 The Coke Art Halloween wallpapers are available in 600×800, 1024×768 and 1280×960 screen resolution sizes. How to install? 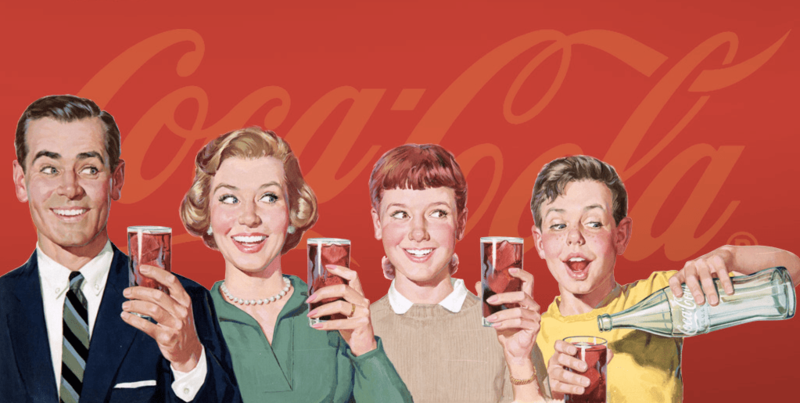 FireFox Users: Right-click your mouse on the Coca-Cola Art wallpaper and select “Set As Desktop Background”. Then click on the “Set Desktop Background” button. Internet Explorer Users: Right-click your mouse on the Coke Art wallpaper and select “Set As Background”. Mac Users: Drag and drop the Coca-Cola Art wallpaper onto your desktop. Do this by clicking your mouse on the Halloween wallpaper, hold down the button while you drag your mouse onto your desktop, then release the mouse button. Your desktop will have to be visible on your screen so you can drag your mouse onto it. And in the meantime, keep an eye out for these spooky pumpkins! 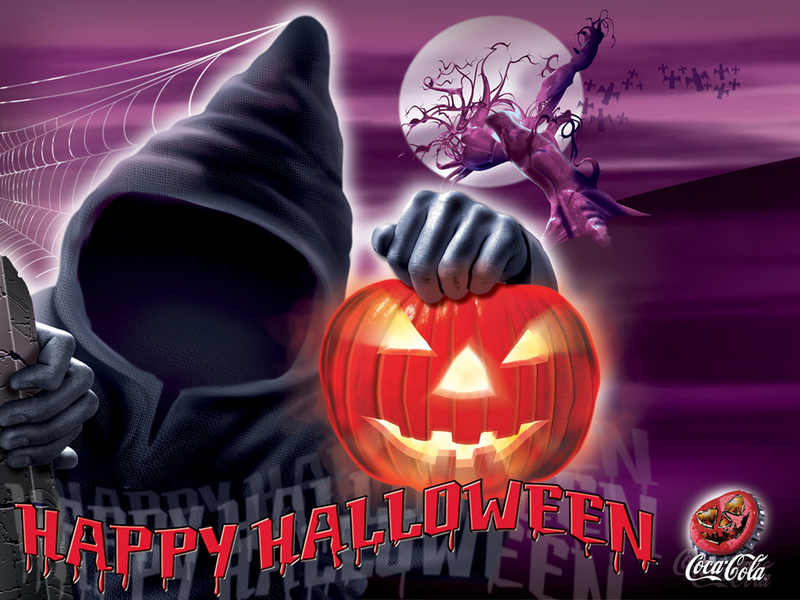 The Coca-Cola Halloween wallpapers (all artworks, illustrations, graphic designs, photo footage & images) are for personal use only. 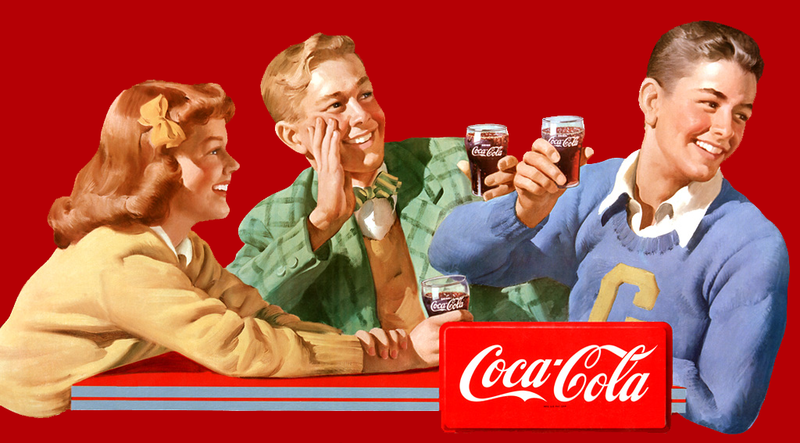 “Coca-Cola’, the worldwide symbol of friendship”, “The pause that brings friends together”. Capturing the spirit of friendship, togetherness and love has always been part of ‘Coca-Cola’. When ice-cold ‘Coca-Cola’ appears, friendship enters the picture. 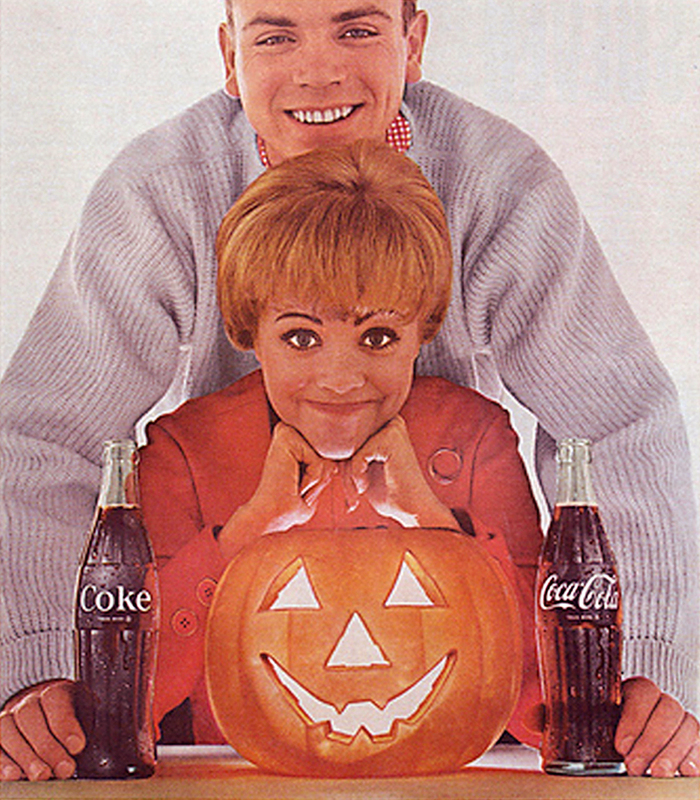 A lot of the Coke advertisements focus on this warm moments. Friendship is the strangest but greatest thing in the world. You could spend hours with your friends doing nothing at all and it can be the best time of your life, just because it was with them. Life is partly what we make it, and partly what it is made by our friends. Over tinkling glasses, minds meet and hearts get closer together. 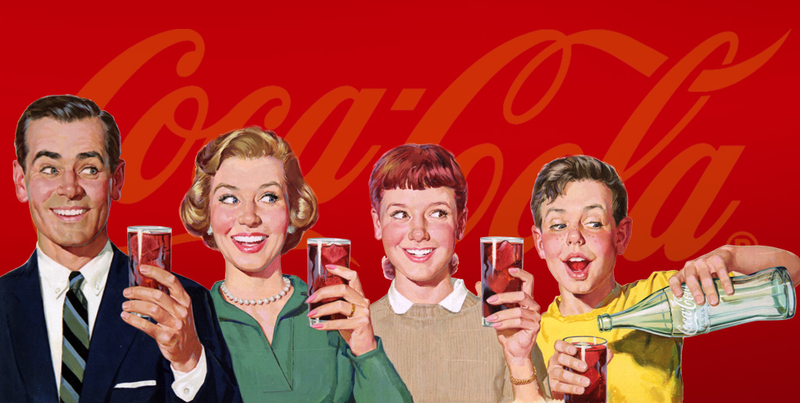 In virtually every corner of the globe, generations of families, friends and neighbors join together to enjoy a Coke.